One hot summer night in the city, all the power goes out. The TV shuts off and a boy wails, "Mommm!" His sister can no longer use the phone, Mom can't work on her computer, and Dad can't finish cooking dinner. What's a family to do? When they go up to the roof to escape the heat, they find the lights--in stars that can be seen for a change--and so many neighbors it's like a block party in the sky! On the street below, people are having just as much fun--talking, rollerblading, and eating ice cream before it melts. The boy and his family enjoy being not so busy for once. They even have time to play a board game together. When the electricity is restored, everything can go back to normal . . . but not everyone likes normal. The boy switches off the lights, and out comes the board game again. 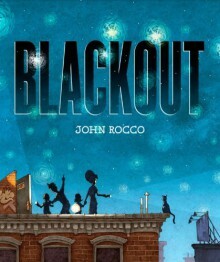 Using a combination of panels and full bleed illustrations that move from color to black-and-white and back to color, John Rocco shows that if we are willing to put our cares aside for a while, there is party potential in a summer blackout. Sometimes it takes a natural disaster - like a blackout - before people can take some time from their busy lives and spend time together. Great illustrations and a great message. Truly dazzling illustrations! My daughter and I were both 'ooohing' and 'aaahing over them'. Very sweet story too!